Brazil is best known for the stunning Christ the Redeemer which stands guard over Rio, and we've got a stunning colouring page showing just that! 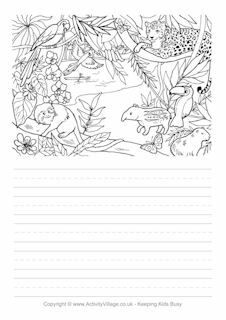 And of course Brazil is also a country of rainforest, so we've got a really lovely rainforest colouring page for the kids to colour in. This interesting colouring page features Christ the Redeemer, one of the most famous landmarks in the world.